Abram's Creek Retreat & Campground is an environmentally conscious, eco-friendly campground and Lodge-Guest House developed in harmony with nature. Abram's Creek Retreat & Campground is a gathering place for people from all socio-economic walks of life, from all cultures, ethnicities, and religious & spiritual backgrounds. Here people can swim together, hike and explore together, enjoy nightly commUNITY bon-fires, and be at one again with divinity through nature. It is also an educational center hosting workshops that range from cultural to spiritual to health related to botany and wilderness survival skills. Abram's Creek Retreat strives to bring a heightened awareness of nature, relaxation, and a deep sense of inner peace to all who spend time here so that they may return to their outer world in peace. Abram's Creek Retreat & Campground is "developed in harmony with nature" and will strive to maintain the original sense of stream valley wilderness that makes the experience here so magnificent. Socially Conscious Spending: We consciously buy products from companies and people who care about people and about the environment. Our main supplier of household goods is Trader Joes and Whole Foods and equivalent. Environmentally friendly: in all ways possible. Recycling: Encouragement of Recycle, Re-use, Repair -- our Abram's Creek Lodge House recycles plastics, metals, and paper-cardboard. We maintain a shop with skilled staff who fix our equipment and tools. We ask our campers to please take their trash with them for recycling. Our Forests: No trees are ever cut down except when absolutely necessary (i.e. road widening / parking area) and even this is very limited. Campsites, paths, and roads were/are created in natural open spaces around the trees. We also harvest deadfall for our firewood piles. Chemicals and Pesticides: No chemicals, pesticides, or environmentally damaging products of any kind are used on the grounds of Abram's Creek or in the Lodge House. Insecticides: No toxic or environmentally damaging insecticides are used at Abram's Creek. Organic Gardening: An organic herb garden is planted each spring and harvested throughout Summer and Fall. Compost: We compost (outdoor natural decomposition) our food wastes. Greywater: Rather than reduce our septic system efficiency with too much water, we utilize a greywater collection system to capture mostly-clean wastewater from showers, kitchen sinks, and laundry that is directed out into the grounds for natural percolation. Lighting: Replacement of all incandescent lighting with low energy compact fluorescent bulbs is omni-present here and some solar lighting is in the works. Water Use: All of the Lodge House and Campground Shower House shower-heads are low flow, 2 gallon per minute / on-off switch type shower heads. We also limit our laundry runs and use a high tech low water washer. Tankless Hot Water: Our Lodge House uses an On-Demand, Tankless Hot water heater (propane) that is 30-50% more efficient than an old fashioned boiler style hot water heater. Drinking Water: Our Lodge House is on well water -- no chlorine, no fluoride, and contains all of the minerals and flora needed for a healthy digestive tract. Weed Control: No chemical weed control products are used at Abram's Creek (a Weed Dragon propane torch and / or a weed wacker is used for maintaining pathways and roads free of weeds and grasses as needed). Cleaning Products: Only green (environmentally friendly, non-toxic, bio-degradable, pet-safe) cleaning products are used here by staff - brands such as Seventh Generation and Bon-Ami. Household Products: Only green (100% recycled materials) paper products are used here including our toilet paper, paper towels, & napkins. Our trashbags are made from post-consumer recycled plastics. Alternative Energy: Use of alternative energies when possible -- i.e. solar lights along roads, and use of ground-contact cooling. Wind Power: We greatly support the local initiatives to construct Windmills along the Allegheny Ridge just a few miles from us, and offer discounted lodging to workers in those projects. Health Destroying Habits: such as smoking, use of drugs, use of alcohol for the sake of getting drunk, and other addictive habit forming substances are highly discouraged at Abram's Creek. Healthy Life-style habits are strongly encouraged! Conservation of Energy / Eco-Conscious Life-Style: We tirelessly attempt to educate all guests as to the importance of conserving energy, turning off lights and TV's when not in use, recycling, repairing, re-using, and dressing appropriately to conserve heat in winter. 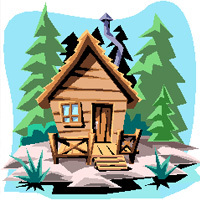 The Lodge does NOT have air-conditioning - the cool mountain climate has never required it in the summer; natural drafts through the house and ceiling fans prevent hot stale air. These life-style habits save us money and help to reduce our carbon footprint and our green house gas emissions. Keeping our Waters Clean: Working with local officials to keep the waters of Abram's Creek pristine and creature friendly for generations to come. Vehicles: We use farm-use vehicles onsite sparingly, and share a car for town trips. We have plans to buy a passenger van to provide group/event transportation between Abrams Creek and the DC area.